We have over 15 years of experience building new boat docks in the Mountain Island Lake area of NC that are both long lasting and beautiful. Do you have a really nice watercraft, yet you don’t get to enjoy it as much as you’d like to because of a decrepit or nonexistent boat dock? New boat docks are not just great for boats – they can also help you get the most enjoyment from your waterfront property. At Renegar Construction, we have over 15 years of experience building new boat docks that are both long lasting and beautiful. 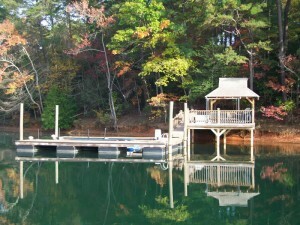 With the wonderful products currently on the market, we can construct new boat docks that go beyond just being useful. Our design staff is phenomenal at creating new boat docks! Your new boat dock can make it easy to enjoy going out on the lake, but it can also be a place to relax, entertain and dine. One of the things that sets us apart from other companies that build new boat docks is that we are familiar with many of the lakes of North Carolina and South Carolina, including Lake Norman, Lake Hickory, Lake James, High Rock Lake, Lake Wylie and Mountain Island Lake. This enables us to deal with the unique properties of these lakes to ensure that your new boat dock is built to overcome any shortcomings. We are capable of doing what is needed to prepare your shoreline, including dredging and retaining walls. Furthermore, our new boat docks are built to last and will need far fewer repairs in the future than one that is not built to the high standards we set for ourselves. Our owner, Gene, goes on every project to make sure you get the highest quality materials and workmanship possible. Give us a call, and we’ll be happy to come out and inspect your property and provide you with an honest, comprehensive quote with no hidden fees. No job is too big or too small!